Check out the Contest Super Simulator. Its free. WriteLog for Windows combines the convenience and ease of use of Windows with the performance and features required by the top contest operators. No other package matches WriteLog’s support for CW, Phone and RTTY contesting, and now, in version 12, SDR spectrum display is built into the band map. Whether you are a casual contester who only makes a handful of QSOs, or one of the big gun multi-ops that demands full networking and spotting support, WriteLog has the score improving features you need. WriteLog has helped introduce many operators to the fun of contesting on the digital modes. It’s support for RTTY and PSK31 using your sound card makes joining the digital game as simple as plugging in a few audio cables. Don’t want to buy a special board just for voice contesting? You don’t need to with WriteLog. The same sound card and cables you use for RTTY can also be used as a voice keyer. WriteLog squeezes incredible functionality out of your computer’s sound card. For RTTY and PSK31, it can copy audio from two different radios simultaneously! As a voice keyer, you can wire different output channels to two radios and WriteLog’s user interface will automatically switch your microphone and recorded messages to the selected radio. WriteLog includes a full CW reader that can copy up to 6 channels of audio simultaneously. 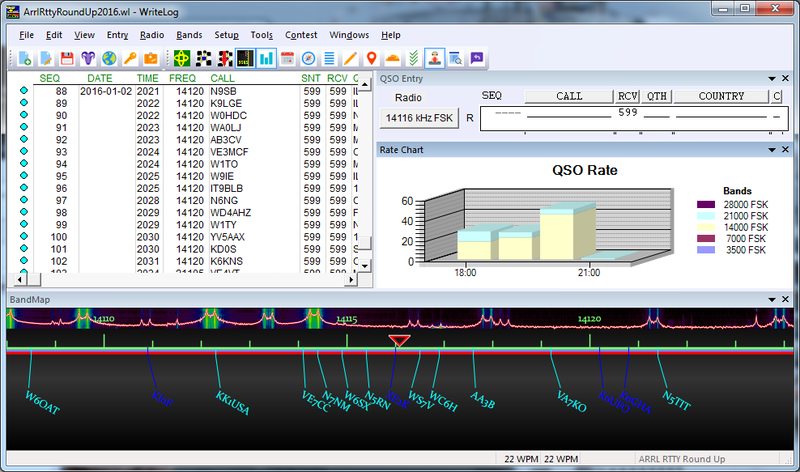 It can even copy CW coming from two radios at the same time. Other helpful operating tools include continuous rate calculation and display, automatic scoring, multiplier check lists, rate graphs, super check partial, check call window, band map, and packet interface. WriteLog includes support for communication with all popular brands of radios. Networking computers for multi-op operations uses reliable, high-speed Ethernet communication capable of updating 500 QSOs/second! Click here to view a sample logging screen. After the contest WriteLog really shines. Just a few mouse clicks and everything you need to submit your contest entry by post or e-mail is ready. Print beautiful log sheets using any Windows compatible printer. Or simply attach the ASCII files to an e-mail and send them to the contest sponsor. Of course there is full support for the new ARRL Cabrillo format. Check out the features of WriteLog compared to the competition. We’re confident you will agree that it truly is the next generation of high performance contest logging software! Leap ahead of your competition and order today. WriteLog can make contesting more fun and help improve your scores!